This dish, made from different kinds of lentils, has become an absolute hit at my place. More so, with my guests who try to guess which dal they are eating. Actually, it’s a little hard to guess when there are so many different types of them in there, cooked slowly till they release their flavors. The reason why I like this dish is that it is a welcome change from the stereo-type rajma/ chole gravies we prepare on special occasions. Its also comparatively nutritious and gives a unique, creamy taste. 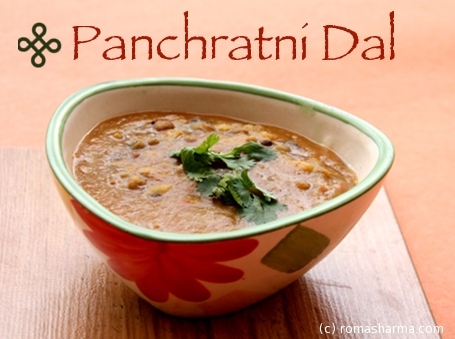 Soak a tablespoon of bengal gram (channa) dal, whole green moong dal, whole black urad dal and brown moth dal for 6-8 hours. Wash dals well and add salt. Pressure cook the soaked dals with a tablespoon each of toor/ arhar dal, yellow moong dal, black masoor dal and red masoor dal. Crush the cinnamon stick, cardamom pod seeds and cloves with the help of a mortar and pestle. Heat the oil. Fry the crushed spices and fry for a few seconds. Add the paste of onion, ginger, garlic and tomatoes. Add a pinch of salt. Fry till the paste leaves oil from the sides. Add the dry spices and continue to cook. Now add the cooked lentils and continue to simmer for another 10-15 minutes. Hi, we are looking to order 60 recepies book, we are based out in Singapore and is there a way we can make an online payment and order the book?… Amazon currently is not supporting the shipping to Asia .. Thanks for your interest in the book. Amazon has the ebook whereas flipkart has the paperback edition for sale. Currently there is no distribution of the paperback edition in Singapore. However, if you want I can notify you when the eBook becomes free on Amazon. Alternately, if you can pay the shipping cost, I can send a copy to you. You can mail me at roma@romasharma.com for more details.